A stunning new study reveals an amazing technique used by Psittacosaurus, a small herbivorous dinosaur. As we reported recently, a team of scientists working with the University of Bristol in the U.K. have discovered a well-preserved fossil that shines new light on how smaller dinosaurs may have dealt with hungry predators coming their way. Researchers have confirmed one of the first camouflage patterns ever discovered on a dinosaur, offering insights into what it took to survive during the Cretaceous period. The study confirms that the dinosaur discovered, known as Psittacosaurus, or “parrot-lizzard,” exhibited some of the same natural camouflage patterns as many living species today. The fossilized remains reveal a brown back and light belly on the dinosaur, a contrast that would have confused predators. Antelopes, fish and a wide range of other animals roaming the earth in the present exhibit similar markings. According to study co-author Jakob Vinther from the University of Bristol, “This one is unique. We can very clearly see that there are color patterns… stripes, spots.” The fossilized dinosaur is roughly the size of a golden retriever, and sports small spikes on its cheeks. It had a beaked jaw and sported quills running down the back of its tail. 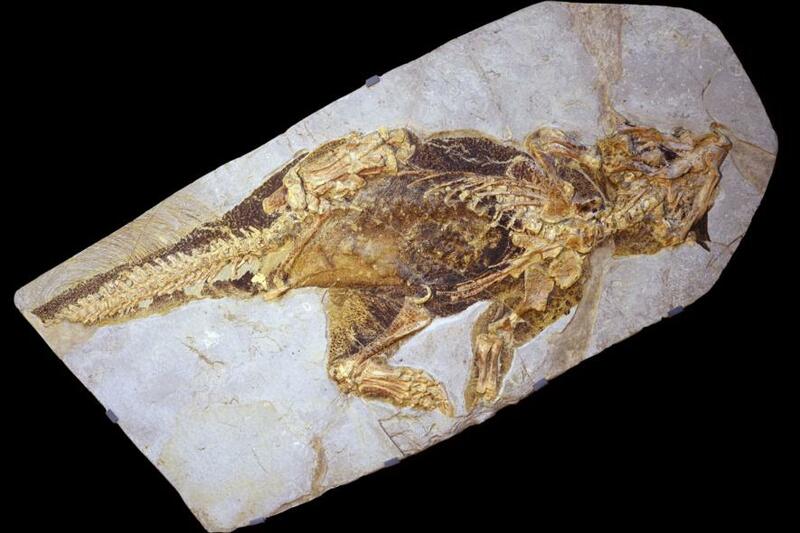 The specimen was discovered in China, where researchers say it lived roughly 120 million years ago. Its camouflage was probably put to good use too — it shared its habitat with Yutyrannus, a massive reptile related to the ferocious T-Rex. Researchers were able to determine the small dinosaur’s color patterns by examining the pigment left over in the fossilized remains. The contrast between the light and dark pigments interferes with a predator’s ability to locate prey using the shadows cast on the object, and was most effective during spotty light conditions. The study was published in the journal Current Biology.